The world of freelancers and freelancing is growing huge and powerful. This self-motivated pool of entrepreneurs and professionals in the workforce has managed to successfully shed negative perceptions. Freelancing is now considered as a hip and cool career option for trendy millennials, and that’s why it’s now progressing to the next level. 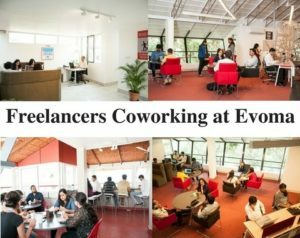 An increasing number of freelancers in Bangalore are now making use of coworking spaces to start a business, instead of working from home. But in order for this growth to happen, the sector will have to attract and involve people who really can see and act on the opportunities and advantages for growth as a freelancer. There’s not much need to highlight the advantages you have as a freelancer: Unlimited income potential, choosing your own work hours, a good work-life balance, being your own boss, to name a few. But it does have its disadvantages too, and what most freelancers in places like Bangalore have been doing until is to simply ignore these obstacles or unpleasant aspects of freelancing. But you don’t necessarily have to, because coworking spaces in Bangalore can give you the best of both worlds – freelancing and a corporate job. So my intention is to show you how to overcome the disadvantages of freelancing by choosing to become a freelance coworker (or is it coworking freelancer?). A survey by email marketing platform Constant Contact concluded that 48% of people believe a meeting to be a more effective driver of business, well above websites and email marketing. But freelancers don’t get much opportunity for face to face conduct. Most of your business is done online and/or on the phone. Social media, email and video chats are great for meeting new people, for long distance communication, and to keep in touch. But in the end, it is good old fashioned face to face meetings that help seal the deal, nurture trust and build strong long-term relationships and partnerships. The Coworking Space solution: We provide you with the physical space needed to conduct these valuable meetings. Unlike having your own brick and mortar office in a commercial office building, you don’t have to worry about deposits and rental, furnishings, utilities, insurance, maintenance and upkeep, etc. Working from home can be nerve-wracking at times for a freelancer. There is no exchange of thoughts, no interactions, no gossiping, brainstorming and, last but not the least, no healthy banter between colleagues. The Coworking Space solution: Coworking gives you a reason to get out of the four walls of your home. It presents you with a change of environment without taking away any of your freelancing independence. You will still be able to clock in and out at will. But you to get meet people every day, enjoy some water-cooler chit chat, bond over a coffee and chill out in the evenings after work over a drink. It brings a freshness to your thinking, to your overall outlook, and helps put a spring in your step. Being in a coworking environment also lets you discover new avenues and leads that might result in new business in unexpected ways. It’s definitely something you can consider as more than a fringe benefit. You can associate and network with your coworkers, and it’s very likely that you’ll learn a lot from them about freelancing, coworking and business success that you would never have otherwise learnt about if you worked from home. Association with exemplary high-performing coworkers will act as a positive influence on you and help grow your business much faster. Working from home poses all kinds of distractions. It could be anything from your attention seeking dog to children, family, personal calls, chatty neighbours, your television, and if you happen to be a foodie, then your refrigerator. It’s virtually impossible to ignore it if you’re in the midst of all this daily chaos at home. The Coworking Space solution:. Provides you with a work atmosphere which is a hybrid blend of office work environment and the informality of work-from-home. You don’t have to face the rigid office rules, and you aren’t bothered by any of the distractions from home. For freelancers, the biggest problem is that it’s either feast or famine. You either have too much work or none at all. There’s no steady pay at the end of the month. There are exceptions who don’t face these ups and downs, but most freelancers will know what I’m talking about. The Coworking Space solution: All your coworkers are potential clients, and they will additionally refer you to people and businesses in their network. So anytime you need more work, just talk to the people around you at your cowork space. Have you sat in front of your laptop the whole night? Have you sleep-walked through the next day? Have you missed your early morning jog or evening gym session so you could complete an urgent assignment? If you have done this and expect to do it again, then you’re a freelancer. The Coworking Space solution: Choosing coworking space allows you to keep flexible timings, but within the time frame of working hours. You can in theory sit and work in our space until 4 am, but we won’t let you sleep on the couch for free. So most of our freelancers and startups will either work through the night, or they will work all day long and then go home at a reasonable hour. Either way, it brings back an element of normalcy to your life. At the very least, you will have a proper schedule for work. Conclusion: The purpose of this article was to show you how a coworking space, especially in Bangalore, a city which pioneered the concept of coworking in India, can help you tackle the disadvantages of freelancing. If you want to test this idea of freelance coworking, then come spend the day at Evoma – free.